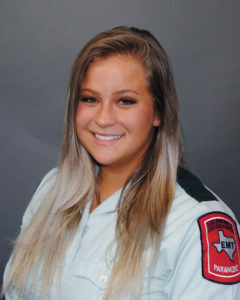 Sloane Brown, Paramedic with Acadian Ambulance in Texas, found her passion for EMS when working as a lifeguard for the City of Allen. At 19, Sloane saved her first life when one of her peers became unresponsive and apneic. Sloane followed her training as a lifeguard to open the patient’s airway and provide rescue breathing until Paramedics arrived. Sloane’s father enrolled her in the very next EMT class. After completing it, Sloane and her father attended Paramedic class together in Burnet County, then volunteered together with the local fire department. Sloane joined Capital EMS in December 2012, then Acadian Ambulance in June 2015. Sloane works in Lampasas County, and has recently become a preceptor. In addition to working full-time, Sloane is taking a full load of college courses. When Sloane is not studying or saving lives, she enjoys spending time with her friends and her two dogs, Stark and Diezel. Sloane was chosen as a Star of Life as she is Acadian’s Texas Paramedic of the Year.